There is no doubt that the majestic mountains of Bare, Rattlesnake, Sugarloaf, and Pok-O-Moonshine inspired countless thrill seekers to climb each one for the individual challenge. Perhaps maybe, in a not-so-distant past, one might have been inspired to have climbed two in one day. In the course of history, we can only wager sorry guesses as to how many people have climbed all four of the majestic mountains, in succession, in one day. The quest to climb all four mountains in one day has evolved from a simple idea to a magnificent event known as the Patch Sprint. 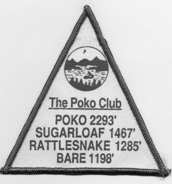 Legend has it that Englishman Jan Burrows came up with the concept for the Poko Patch in the mid-1980's as a way to motivate younger campers to achieve a short term goal, and experience four of the beautiful mountains surrounding Pok-O-MacCready: Bare, Rattlesnake, Sugarloaf, and Pok-O-Moonshine. The idea was simple yet effective; climb all four mountains and earn yourself a Pok-O Patch. This could be accomplished over the course of a 3-day stay at the Outdoor Education Center, an 7-week summer session, or over the course of many years. In the summer of 1986, Pok-O nurse Doc Browning and counselor Jody Edwards thought it would be a good idea to try to earn their Poko patch in one day. On one of the hottest days of that summer, they set out from camp and arrived 8 hours and 22 minutes later atop Pok-O-Moonshine. The trip was not without incident. In an attempt to find a more direct route up Sugarloaf, the two found themselves scaling cliff walls riddled with poison ivy. The rashes eventually went away, but the fame of being the first in recorded history to scale all four of the Poko Patch mountains in one day will go on for all time. A year later, The Pok-O Patch time was bettered, to 6 hours and 41 minutes. The groundwork for bettering a previously established time was set-- a concept that would figure prominently into the evolution of the Patch Sprint. On a winter's day early in the 1990's, longtime camper, counselor, and outdoor education staffer John Rayburn set off from camp to complete the Pok-O Patch in a day. 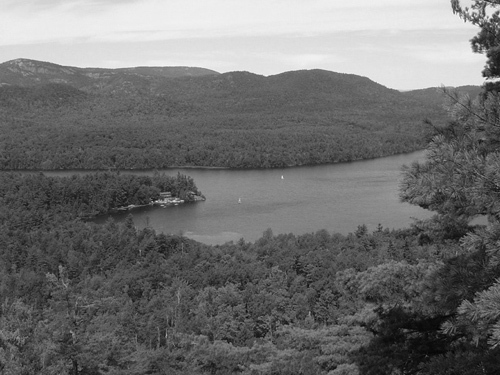 Rayburn was not looking to complete the course in a certain time; he was utilizing a day off to hike four of the mountains he had grown to appreciate during his many years at Pok-O-MacCready Camps. In doing so, he wrote himself into the Patch history books by becoming the first known person to complete the Pok-O Patch in one day in the winter. 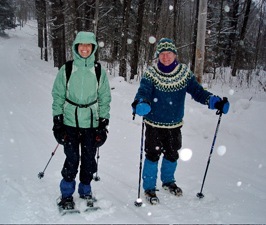 His journey is the predecessor to what is now know as the "Winter Sprint." In 1996, Tim Singer thought it would be a good idea to attempt to better the Patch in a Day time of 6 hours 41 minutes. Perhaps several people did the Patch in a Day between 1987 and 1996, but it had not been documented. Singer contacted Outdoor Ed. staffer and summer camp counselor Greg Henderson to discuss setting a new record. 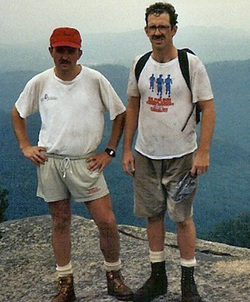 On June 1, 1996, Singer and Henderson started off from the 1812 Homestead, and completed the full course in 3 hours 14 minutes (and 8 seconds). It was around this time that they came up with the new name: "Patch Sprint." They did not reveal to others at camp what they were attempting to do, but rather undertook it as a personal challenge. The next year in 1997, five individuals (Tim Singer, Greg Henderson, Jay Fiegl, Marco Corell, and Tom Edwards) broke the three hour mark. They took a break in 1998 due to the ice storm's devastation of the woods in the area, but Singer and Henderson ran it again in 1999 on Memorial Day Weekend, this time starting at the pillars marking the entrance to camp. A tradition was born. The more practical reason to open it up was to help raise money for the Adirondack Scholarship Foundation, a mission that has been central to the Patch Sprint since it first went public in 2000. Each year, more funds are raised for the Adirondack Scholarship Foundation to help kids attend camp who cannot otherwise afford it. And so, weekly press releases beginning in January 2000 describing events, happenings, and the athletes themselves started the hype - a tradition that has carried over from year-to-year. 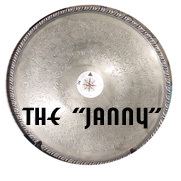 The winner's trophy was purchased in an antique shop in Plattsburgh, and was named the "Janny" in honor of the Poko Patch founder Jan Burrows. Jim Kobak was the first to win the newly publicized event in 2000, takinghome the Janny in 2:26.44. He would go on to win several more times, in addition to designing the T-shirt design every year after 2000. 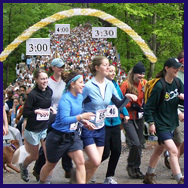 The Patch Sprint has grown every year since 2000, both in the number of participants, spectators, and - most importantly - money raised for the Adirondack Scholarship Foundation. Each year brings with it a tradition and familiarity that brings back over 90% of the previous year's attendees. The event has grown into not only a full-fledged Pok-O-MacCready reunion, but also as a way for those who love camp to bring their friends and families to share in a weekend of fun, challenge, food, social gatherings, and service to Pok-O-MacCready Camps. While the Patch Sprint is the central activity of the weekend, all other events surrounding the sprint have become events in and of themselves. There are the divisions for everyone: Men, Women, Kids and Trekkers, which allow most anyone with the will or desire to participate in this great event to do so. There are the meals and parties: carbo-load dinner/expo, pre-race breakfast, post-race awards banquet, and the post-post race party. There are prizes and extras: aid station support, T-shirts, finishing medals, and other awards. There is the service to Pok-O-MacCready through volunteering for it's semi-annual "WOW" work weekend. And of course, there is the important task of raising funds for the Adirondack Scholarship Foundation. By 2013, the Patch Sprint had become too popular, selling out every year and shutting out many friends, and the regions best endurance racers. In response to this, and as a way to keep the Patch Sprint more of a friend and family event, organizers created The Pond Sprint, which offers an opportunity for both friends and elite runners to take on a similar, though different challenging and scenic course. ​Read much more about this event, held annually in October. What will the future bring for the Patch Sprint? Certainly many more years of fundraising, reunions, and parties. When will somebody finally break the 2 hour mark? (Answer: 2018)... Will there be chip timing with stations posted on top of each mountain? And finally, will the Patch Sprint someday be accepted as an Olympic event? These are all questions that the future holds. 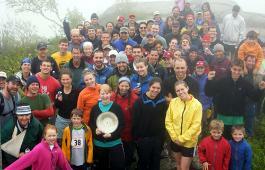 For now, the Patch Sprint will continue on as it has always been; the greatest event in the North Country!